Transition To Soil Health equips growers to understand all the aspects of soil health, identify the key constraints particular to their situation, implement a practical action plan for improvement, and measure the outcomes to assist ongoing practice change. After years of involvement with soil health projects we found that people are getting lots of good information, but struggle to put it into practice. Transition to Soil Health is a new program that equips agricultural land managers to understand what soil health is, identify the constraints to soil health on their own land, develop an action plan to improve it, scientifically measure the outcomes and plan for ongoing practice change. 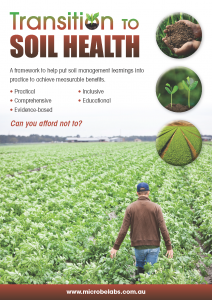 Transition to Soil Health is INCLUSIVE – it does not promote any single practice or product, it is a framework to help land managers set and achieve their own soil health goals with professional guidance and appropriate measurement tools. You can use it to plug in your particular knowledge, methods, etc. that you know work in your area. There is a manual and workbook for participants to work through in understanding their constraints and setting their action plans. If you’re looking for a practical, inclusive and evidence-based program to help set and achieve measurable soil health goals that work with local knowledge, Transition To Soil Health is for you.